Brooke is an expert at repairing cars. Fixing herself—not so much. But maybe Cody and Justin can finally repair and heal her wounded soul. 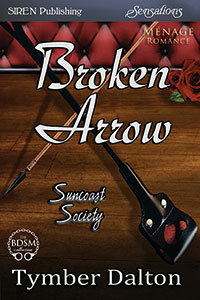 Click here to read an adult excerpt from Broken Arrow. Brooke is a wounded vet who took over her father’s classic car repair business when tragedy forced his early retirement. She’s great at her job. But fixing herself? Not so much. She’s shut herself off from life as a form of penance and a survival mechanism, until her friend Eliza decides Brooke needs a night out. Cody and Justin are lovers and partners. They’re Doms, but not to each other. They’ve also fallen into a relationship rut. When Eliza introduces them to Brooke, they discover they have more than classic cars and The Walking Dead in common. Brooke knows life is meant for the living, but in many ways she feels she’s forgotten how. As she grows closer to the men, she realizes maybe it’s time to try something different and look for happiness somewhere other than TV shows and her cat. And that, maybe, it’s time to let the hunky Doms show her how they want to love her.